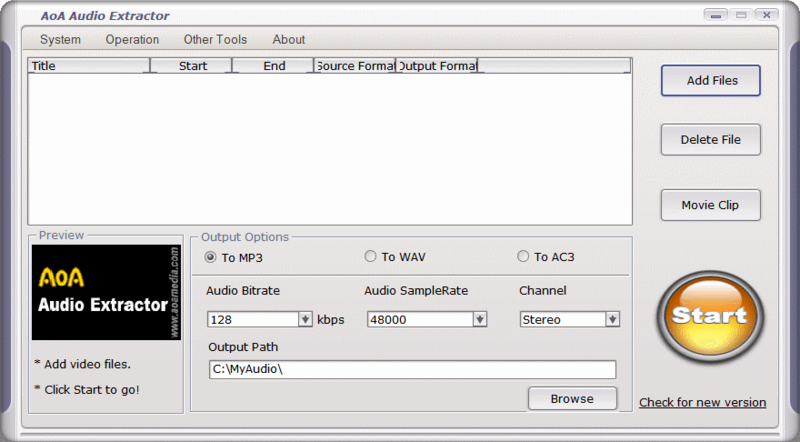 AoA Audio Extractor allows you to extract audio/sound or background music from video files. It supports extraction from AVI, MPEG, MPG, FLV (Flash Video), DAT, WMV, MOV, MP4, 3GP video files and exporting the audio as MP3, WAV and AC3 audio files. It can also be used to save any portion of the audio of a video file. Stealth: ? No. Registers some COM components. Pazera is the way to go. Awesome yet free. Thanks a million Pazera. "Extract audio tracks from video files to MP3, AAC, AC3, WMA or WAV. AVI to MP3, FLV to MP3, AVI to WAV"
"This program doesn't use system registry and can be run from portable devices. All settings are written to INI file." You must be administrator to install, worthless to me. Btw, WinFF will do it for free with as many as you like. Its cripple ware, you can only do 3 files at time without paying them. extracted with universal extractor and copied file in sys andapp folders to a new folder and run the exe file. All I get is an error message. What am I doing wrong? So far so [very] good. I've converted a dozen of FLV's to mp3 without any problems. An additional plus is that it automatically opens the destination folder after conversion is complete. I like it! I used to use this, until I realized how easy it is for VLC to extract the audio from .flv files and save them as .wav or .mp3. If you don't have VLC, this is your best bet. I tried it on one file - it worked. I tired it on two files at the same time and it worked beautifully on them too! This sucker is great!